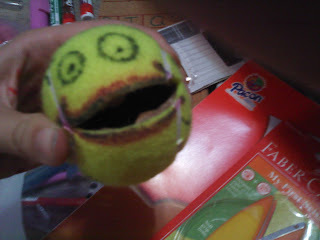 Meet my tennis ball friend. Hold him open to give him yummy treats like pennies, then he can throw them up! The wider the mouth you make, the less resistance….I'm still on the lookout for the smaller tennis balls for smaller hands.